11 STANDARD sizes with 135° neck-shaft angle and 7 LATERALISED sizes with 127° neck-shaft angle. 8 STANDARD sizes with 135° neck-shaft angle and 7 LATERALISED sizes with 127° neck-shaft angle. 10 sizes with 127° neck-shaft angle. The Quadra System is comprised of 2 cementless stem options sharing all mechanical characteristics, but with different surface treatments: the Quadra-S is sandblasted and the Quadra-H has an HA coating. Quadra-S and Quadra-H are made of Titanium Niobium alloy: Ti6Al7Nb. 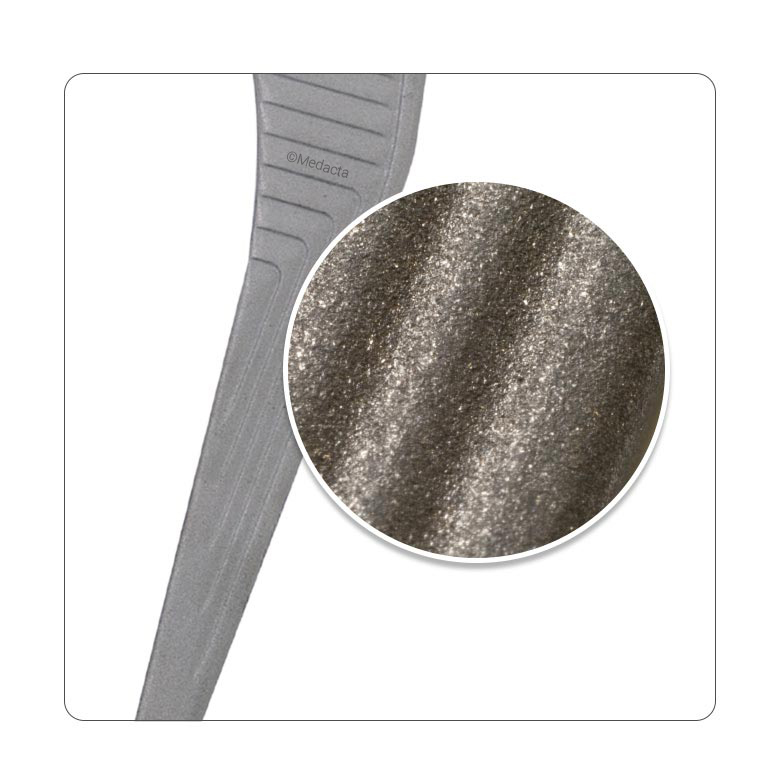 Titanium is an inert and biocompatible material ideal for direct interaction with the bone. [5,6,7] Titanium also presents the ideal stiffness for a cementless stem, avoiding stress shielding. The surface has a superficial roughness between 4μm and 7μm thanks to a specific sand blasting treatment on the whole shaft. Based on the experience of the straight, rectangular cementless stems. Triple taper with trapezoidal cross section providing for axial and rotational stability with optimal anchoring to the bone. 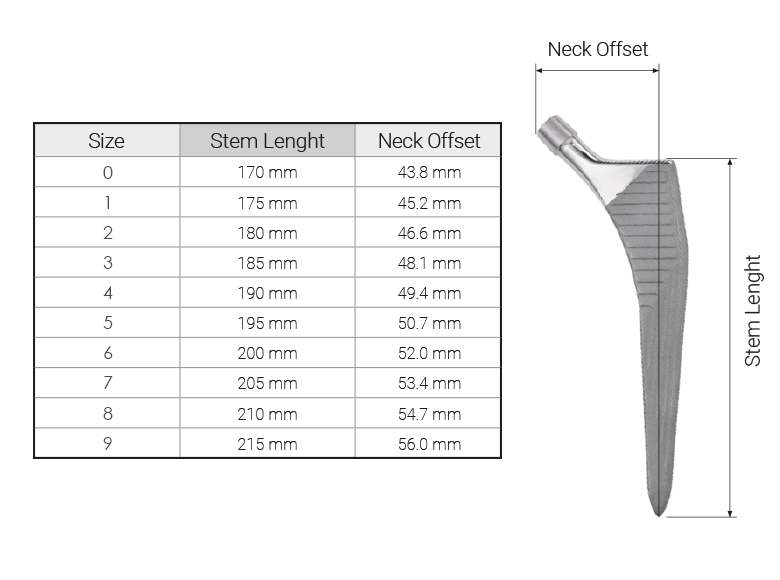 Multiple offset to meet the patient needs including standard, lateralised and short neck options. Mirror polished rounded neck to minimize wear. Suitable for Double Mobility liners. 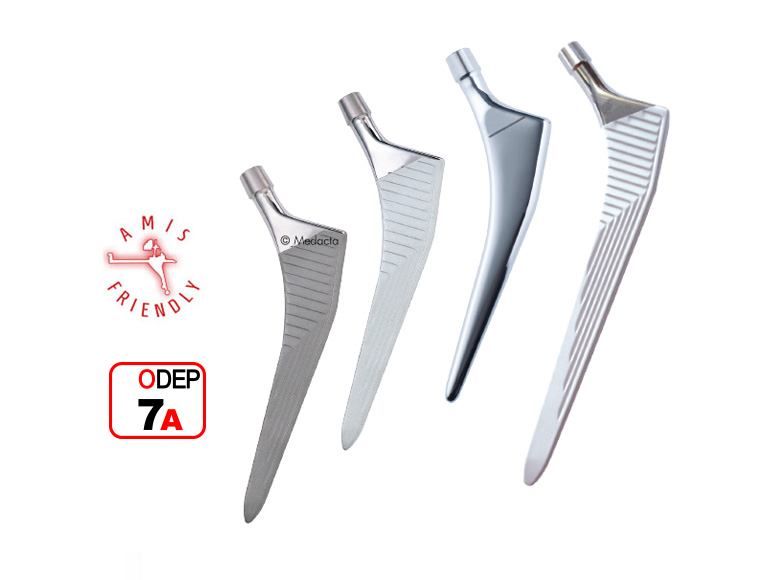 Close contact between the stem and the cortical bone due to the tapered shape and high precision broaches. Minimized stress-shielding and potential for loosening. Reduced lateral shoulder ideal for MIS approaches. Horizontal and vertical macrostructures increase the contact surface area by 10-15%. 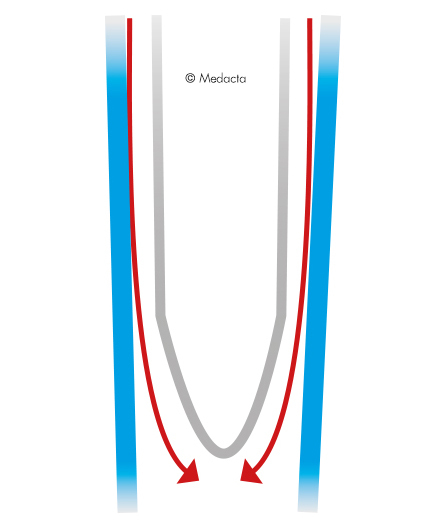 The proximal horizontal macrostructures increase the axial stability. The vertical distal macrostructures increase the rotational stability. Sharpened edges account for an optimal primary diaphysieal fit. 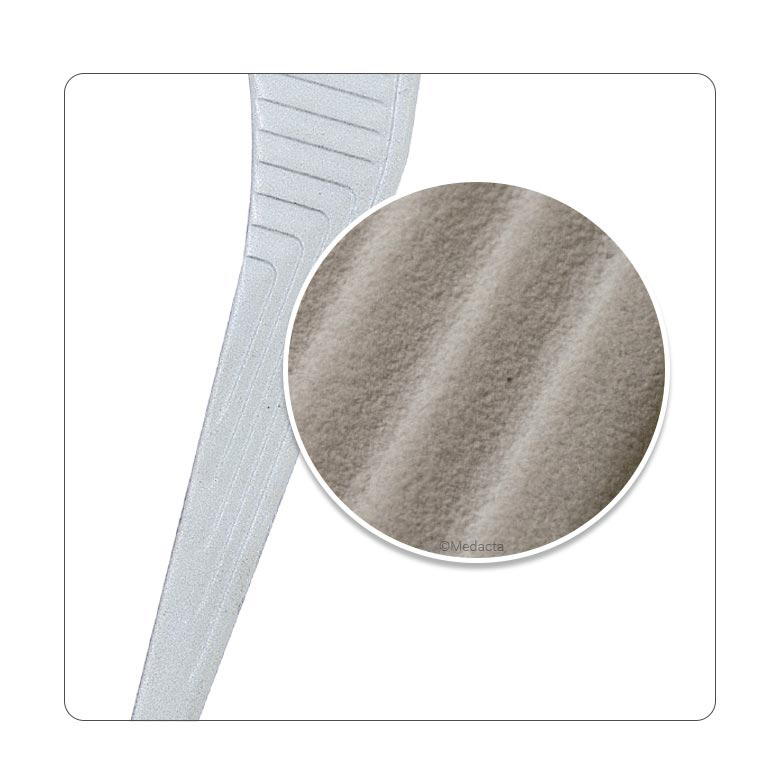 Double tapered distal tip reduces the risk of stress peak in the diaphysis. 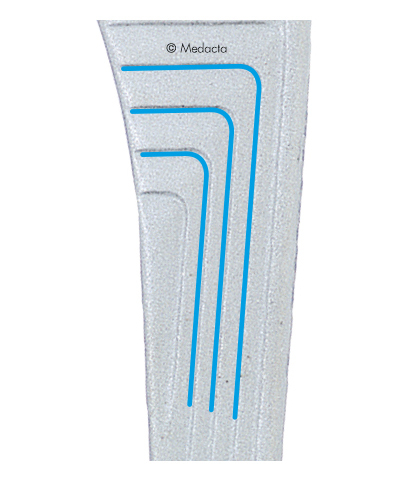 Quadra-C is the cemented stem available with the Quadra System. In high nitrogen stainless steel providing the ideal stiffness for a cemented solution. Mirror polished surface for a correct interaction with the cement mantle. Rounded edges to avoid peak stresses within the cement mantle. Same 12/14 taper as Quadra cementless stems. Same instrumentation as Quadra cementless stems. 135° and 127° neck-shaft angles. 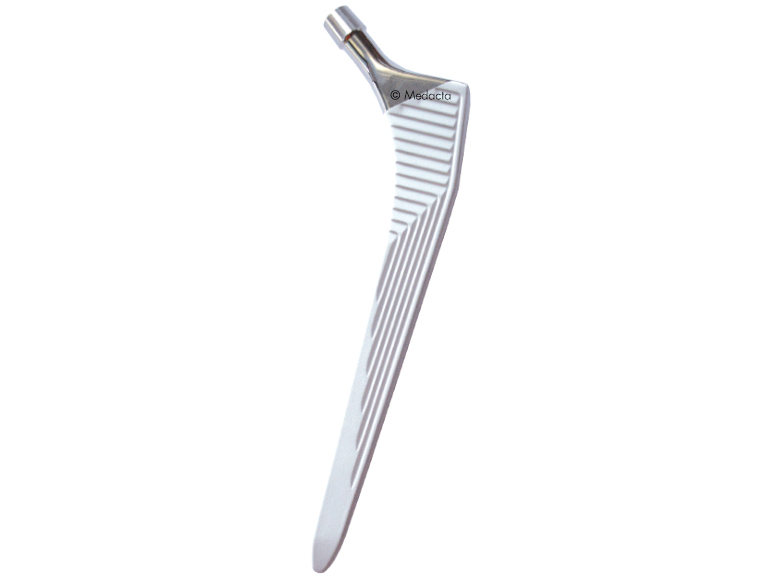 Quadra-R is a cementless straight long stem for revision purposes or pertrochanteric fractures available with the Quadra System. Same 12/14 taper with mirror polished neck. The surface has an 80 μm thick HA coating on the whole shaft applied after a superficial sand-blasting. 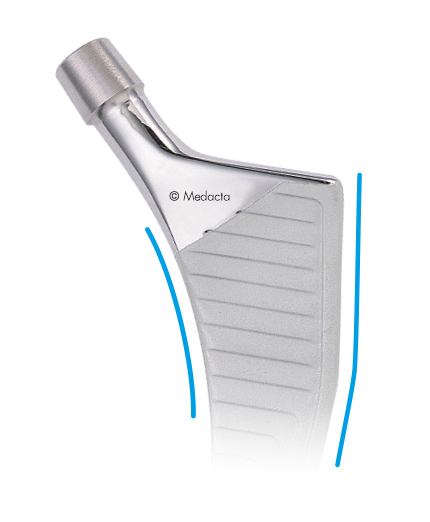 Quadra-R is available with 127° neck- shaft angle. 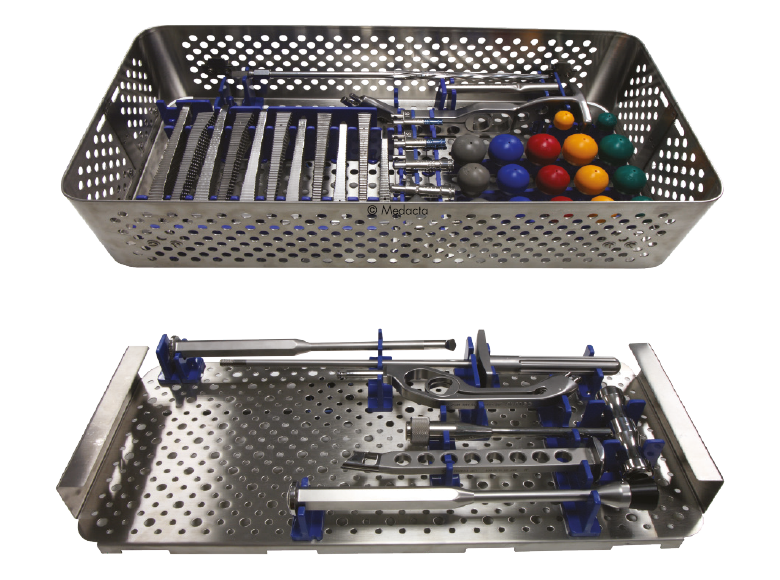 A dedicated instrumentation tray is available. 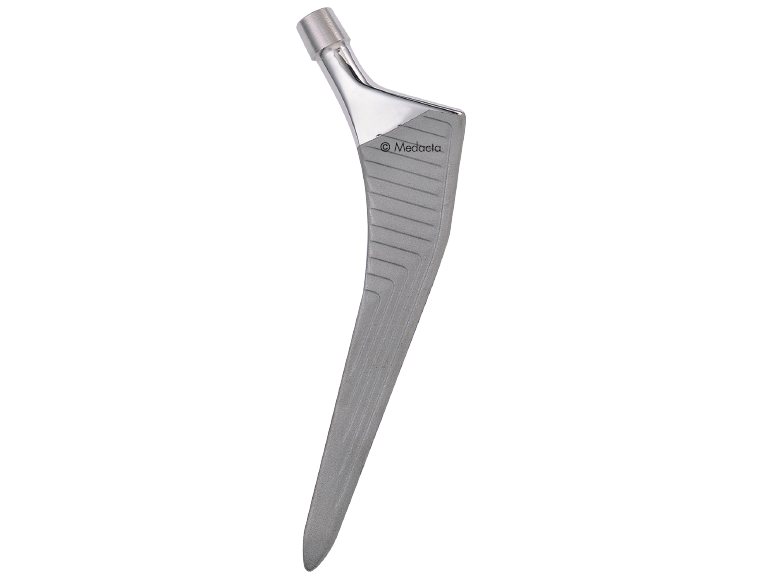 Quadra-R is designed from the Quadra stem, adding a longer and more important distal shaft to the stem for more distal stability in the femoral cavity. The same tray to implant Quadra-S, Quadra-H, Quadra-C*. 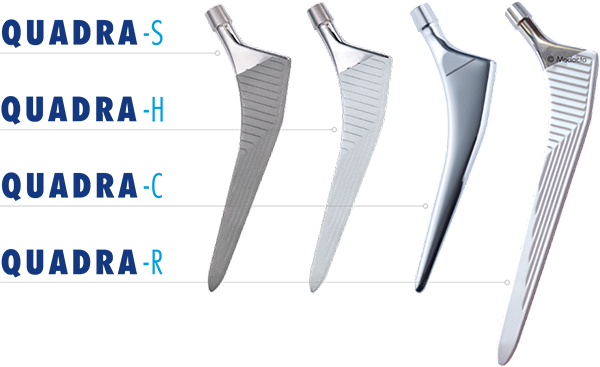 Both standard and lateralised trial necks fit onto the broaches for a quick and precise trial reduction. Reliable handy manual and motorised broach handles. 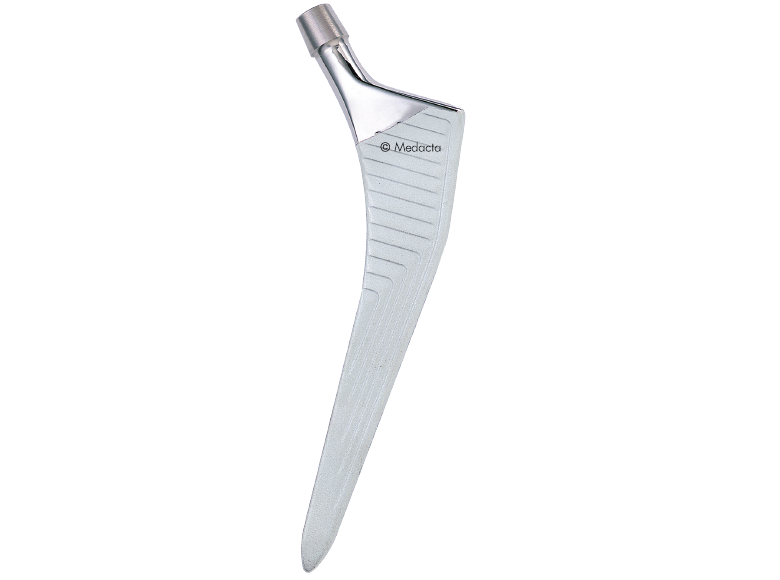 Monoblock motorised broaches option available to be used with femoral stem trials. 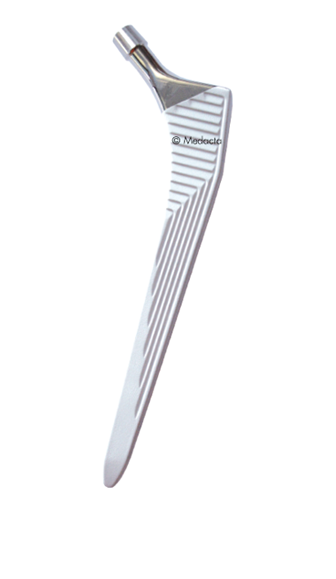 High quality sharp broaches for a precise preparation of the medullary cavity. * Quadra-R instrumentation requires a different tray for dedicated broaches and trial necks. AMIS is the Anterior Minimally Invasive Surgery provided and supported by Medacta International. Add one tray to have all the specific instrumentation for the AMIS approach! 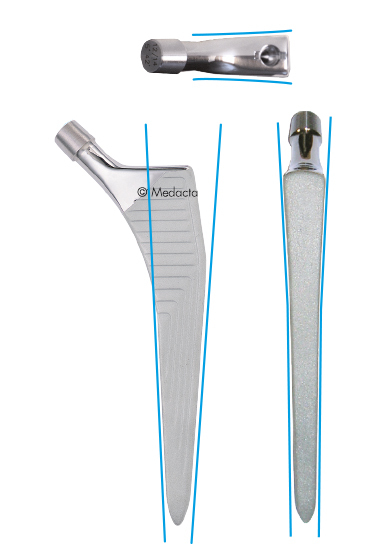 Medacta, in collaboration with the surgical world, has developed a set of instruments with the aim of reducing errors, reducing the learning curve and simplifying the implementation of the AMIS technique. You will find special retractors, reamers, cup impactor and of course special broach handles! 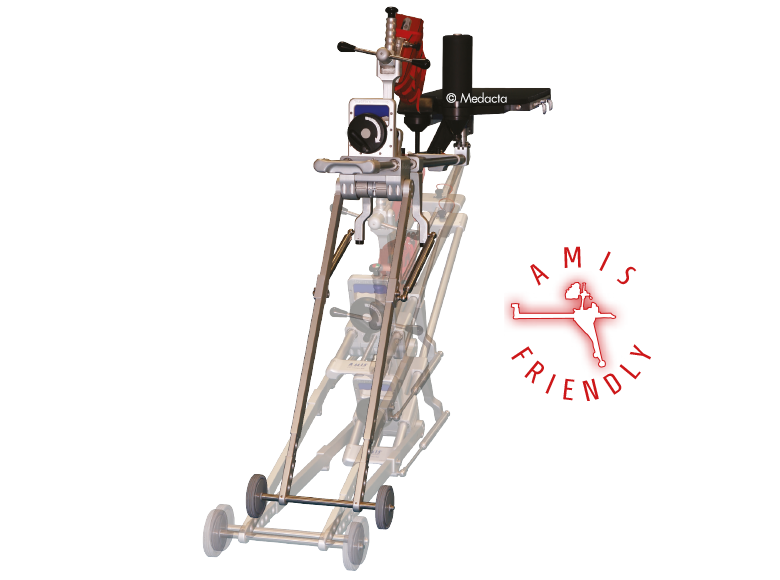 The AMIS Mobile Leg Positioner will be supplied as part of the instrumentation to allow a effective and reliable positioning of the leg during surgery. Traction, adduction, rotation and hyperextention have never been so easy. 20 years of Zweymüller cement free hip endoprosthesis Jatros Orthopädie - Jahrgang 5 Dez. 1999 - ISSN 0941-4770. Zweymüller K. 20 years of Zweymüller hip endoprosthesis Hans Huber Verlag 2002 ISBN 3-456-83431-4 pp 29-39. Bonnomet et al. Comportement d’une tige fémorale droite en arthroplastie totale primaire non cimentée de la hance chez les patients de moins de 65 ans Rev de Chir Orthop 2001, 87, 802-814. Cementless HA coated Quadra stem – 7 years clinical outcomes. Dr. Moreau, 2008. Data on File MEDACTA. Lintner F, Böhm G et al. Tissue Reaction to Titanium Stems. 10 Jahre Zweymüller. Verlag Hans Huber 1991. Böhm G, Lintner F et al. Morphometrical findings on individual titanium stems. 10 Jahre Zweymüller. Verlag Hans Huber 1991. Lester DK, Campbell P. 100-year-old patient with pressfit prosthesis: a post-mortem retrieval study. Am J Orthop. 1996; 25(1): 30-4. Heidelberg Lab-Report, Orthopädische Universitätsklinik Heidelberg, 2005. Data on file MEDACTA. Zweymüller K. 20 years of Zweymüller hip endoprosthesis Hans Huber Verlag 2002ISBN 3-456-83431-4 pp 11-25.